Another Haiti government has been ousted. Haiti’s Lower Chamber of Deputies fired Prime Minister Jean Henry Céant and his government on Monday, deepening uncertainty amid a political and economic crisis that led to violent protests last month and the U.S. and Canada warning citizens not to travel to the country. The swift no-confidence vote came with hardly any debate and after Lower Chamber President Gary Bodeau noted that neither Céant nor any of his cabinet ministers were present. Deputies voted 93-6 in favor of censuring the government with three lawmakers abstaining. But as Céant waited for a quorum in the 30-member Senate Chamber, Bodeau proceeded with his hearing despite having received a letter from the prime minister informing him that he had already been summoned to appear by the Senate and would be unable to make it. Bertrand, who had voted against Céant in September when lawmakers overwhelmingly approved his political program in back-to-back marathon hearings, said his stance on Monday was one of principle. He said deputies were more “interested in their pockets” than doing the right thing. At 4:23 p.m. Senate President Carl Murat Cantave tweeted that due to the lack of a quorum, the prime minister’s session is being rescheduled for Wednesday. The Senate is trying to fight Céant’s ouster. Céant and his 21-member cabinet will remain in office as caretakers until a new prime minister is named by President Jovenel Moïse and a new government takes control after both chambers of parliament approve. Under Haitian law, a caretaker prime minister and government can only oversee the country’s day-to-day affairs, and cannot enter into any new contracts. This will have major ramifications for not only Haiti’s ongoing economic crisis — inflation is 15 percent annually and the cost of basic staples is skyrocketing — but also on the immediate disbursement of millions of dollars in badly needed international aid. Last month the International Monetary Fund agreed to provide Haiti with $229 million in loans at zero percent interest paid over three years. But the money, which included an initial disbursement of over $40 million, was conditioned on the government carrying out several measures including reducing its budget deficit, implementing social protection programs and getting approval for the budget from parliament by May. The European Union, Inter-American Development Bank and World Bank had also agreed to provide an additional $60 million in assistance before the start of the June 1 hurricane season. That $100 million in aid disbursement is now dependent on how quickly lawmakers can agree on the next prime minister, which will be Moïse’s third since taking office in February 2017. Céant’s fate had been a matter of debate since last month, when opposition political parties and anti-corruption protesters known as PetroChallengers locked Haiti down for 10 straight days. Schools, businesses and public transportation came to a halt as thousands took to the streets throughout the country in demonstrations that eventually turned violent. While some demanded an accounting of about $2 billion from a Venezuela oil fund under the PetroCaribe program, others demanded the resignation of Moïse, who in an address to the nation after eight days of demonstrations blamed Céant for the deepening economic crisis. The president said he had tapped Céant, a lawyer and well-known notary who had challenged him for the presidency, to replace former prime minister Jack Guy Lafontant, but Céant had failed to deliver. Lafontant, a political novice who had never held public office, had abruptly resigned in July as he faced a no-confidence vote in the Lower Chamber of Deputies, after his mismanagement of a fuel price hike sparked three days of violent civil unrest and the cancellation of international flights. 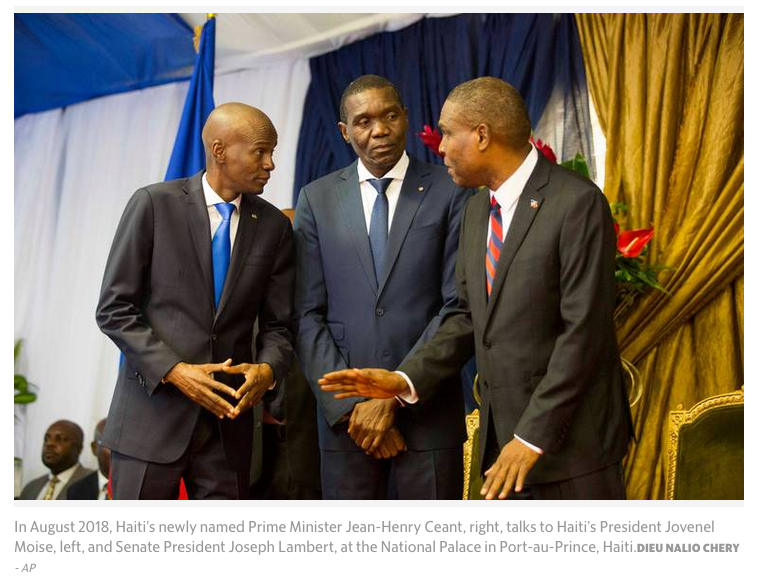 Last month as tensions mounted both on the streets and within Haiti’s executive branch between the president and prime minister, Céant confirmed to the Herald that Moïse had demanded his resignation. He had refused, he said. Céant then announced a list of economic measures, including reducing the government’s expenses and subsidizing the price of imported rice in hopes of quelling tensions on the streets. But his detractors argued that the measures were not enough and he has not delivered on promises, which included ambulances in communities around the country, new roads, the development of several regional airports, the reorganization of the mining bureau and new social and economic pacts to attract domestic and foreign investments. Céant’s supporters, however, have noted that while he was in charge of the government he lacked the latitude to govern. Most of the government, for example, was not of his choosing and Moïse is known as a micro-manager. Deputy Jean Marie Forestal, who introduced the no-confidence measure in the chamber on Monday, cited both the country’s dismal economic situation and the ongoing tensions between Moïse and Céant as the reasons on why the government needed to go. Forestal added that contrary to the promises Céant made when he outlined his programs, his government had failed to address Haiti’s import bill by pushing national production, or deal with the devaluation of the domestic currency, the gourde, to the U.S. dollar. “The national currency has deteriorated considerably,” he said. In an interview with the Herald last month, Bodeau promised that he would move to get rid of Céant as soon as the law permitted. That arrived on Sunday, when the prime minister officially marked his six months in office, which under the Haitian Constitution meant that his protection from firing was now over. Symbolically, Bodeau said, he had already conveyed to the government that it should resign when he took the unusual decision to reject Céant’s proposed budget because it did not address the social problems such as the teachers’ arrears, reducing inflation and the budget deficit.